Churchill Park is made up of four neighbourhoods: Whiteway Street, Poplar Avenue, Churchill Square, and Portugal Cove Road South. Each of these neighbourhoods were created by the statistical agency to show differences, including different median incomes for individuals and families. The people of each neighbourhood have to pay taxes and this affects their median incomes differently in the years 2011 and 2013. The median income for individuals and families in the neighbourhoods of Churchill Park shows both changes after individuals pay their taxes to the provincial and federal governments and discrepancies between the neighbourhoods median incomes in general. The median income for the four Churchill Park neighbourhoods in 2011 and where they rank among other neighbourhoods in St. John’s did not change from before taxes to after taxes in 2011 or 2013. Whiteway Street is the odd one out of the four when compared to the rest of St. John’s, as it ranked in the bottom tier of median incomes in St. John’s in both 2011 and 2013, while the other three ranked towards the middle and upper tiers in St. John’s. The median income for families shows a discrepancy between the neighbourhoods in 2011 and 2013 as they have vastly different median incomes between them this can be contributed to employment rates and who lives in these neighbourhoods. The employment rates of the Churchill Park neighbourhoods ranked in the middle and upper tiers of in comparison to the rest of St. John’s, except for Churchill Square home to many full time students, which ranked towards the bottom tier. The employment rate factor suggests the income difference between two neighbourhoods could be because higher employed neighbourhoods would have more income than lower employed neighbourhoods. For example, Poplar Avenue had a median income for families of roughly $94,000 in 2011, while having a higher employment rate at 73.7%, in comparison to Whiteway Street which had a median income for families at roughly $28,000 and an employment rate of 61.7%. As well as employment rates, who lives there mattered. Whiteway being closer to Memorial would likely have had more full time students than Poplar Avenue. The amount an individual has left after taxes is considered their personal income, to spend on their needs and wants,. What the people in the neighbourhoods paid in taxes varied greatly. The number of higher market income earners in a neighbourhoodhad a big effect on how that specific neighbourhood was taxed. The other factor is the different types of incomes individuals in these neighbourhoods receive besides a salary or wages. 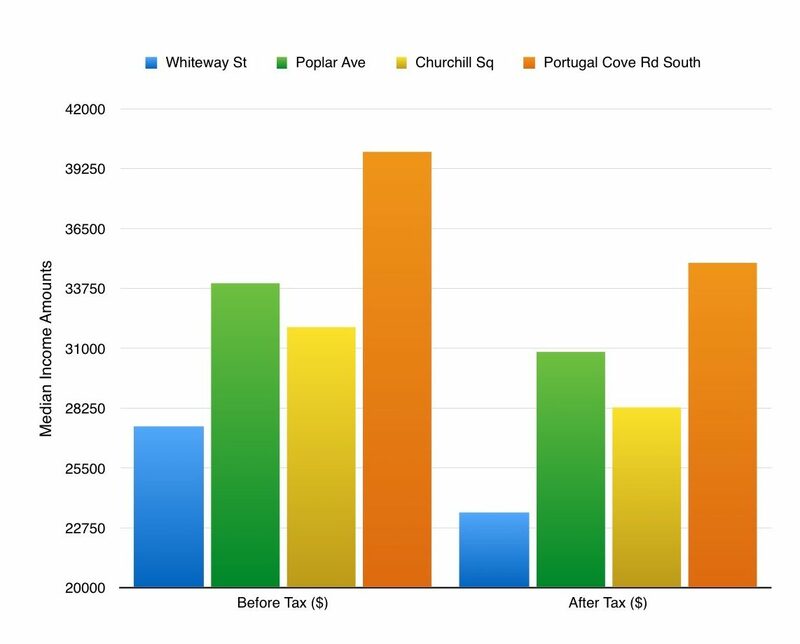 In this category Churchill Square has no data in 2011 and 2013 regarding transfer income while Whiteway Street ranked in the bottom tier of transfer income and the other two neighbourhoods, Poplar and Portugal Cove ranked more towards the middle tiers of transfer income in comparison to the rest of St.John’s. Both of these factors affected the median income of the neighbourhoods and how taxes affect the median income in the neighbourhoods in different ways. The larger number of high market income earners will cause a neighbourhood to be taxed more than others. 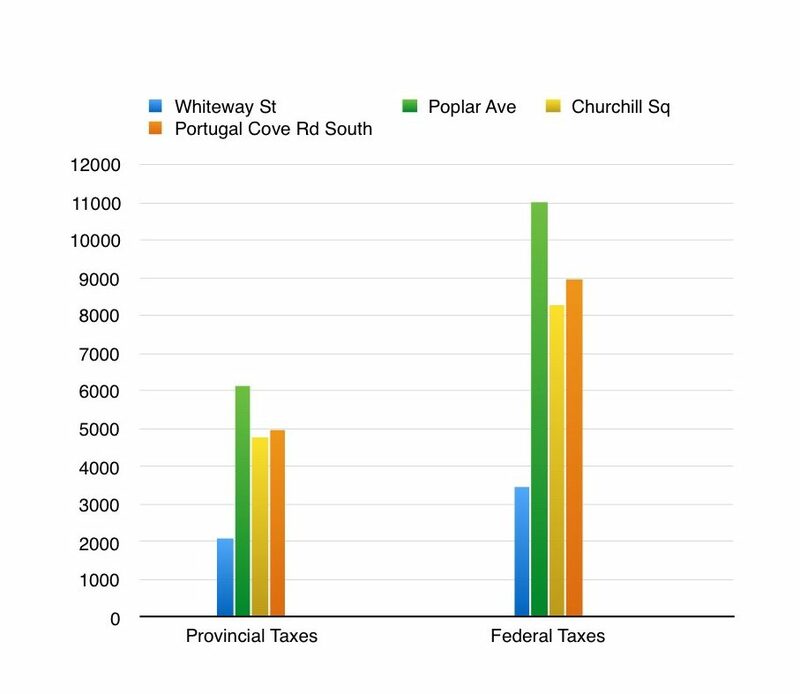 For example Poplar Avenue was taxed the highest out of all the neighbourhoods in Churchill Park, by comparison Whiteway Street which had an average employment income of roughly $30,000 had the lowest tax rates in Churchill Park. Transfer income and other types of income that the majority of population does not receive, such as capital gains or dividends, also affect taxes. Transfers allow for lower median income neighbourhoods to receive a redistribution of income from the government which makes their income greater. The median incomes of the four neighbourhoods located within Churchill Park are each affected differently due to the distinct character of each neighbourhood, with the median market income of the four neighbourhoods not being taxed the same as the median income in 2011 or 2013. For more on employment rates see this page.